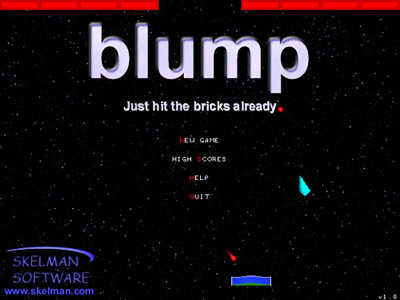 Blump is a classic breakout-type game. 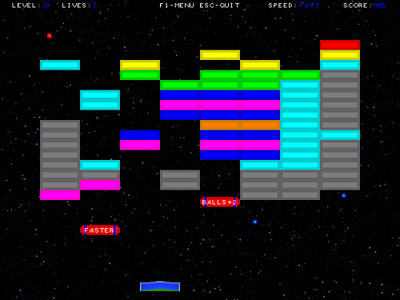 Fly through space with your ship as you deflect the balls to destroy all the blocks. You start with 7 balls, all at once for some crazy action. As you destroy blocks, powerups will fly down towards your ship. Grab the powerups, and keep the action going. 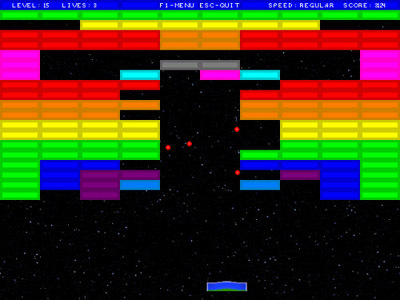 Try to top the high score list, and complete all 30 levels. Use the mouse or arrow keys to control the ship. Released on January 9, 2002. To download Blump v1.0, visit the download page. You can get it here.